Thoracic outlet syndrome (TOS) has been an important clinical entity for more than a century. In 1821, Cooper described axillary-subclavian artery symptoms due to compression from a cervical rib. In 1875, Paget described clinical symptoms resulting from subclavian vein thrombosis (eg, arm swelling, pain). In 1884, von Schroetter correctly attributed these upper-extremity symptoms to thrombosis or compression of the subclavian vein at the thoracic outlet. Consequently, venous thrombosis at the thoracic outlet is known as venous TOS or Paget-Schroetter syndrome. TOS has distinct clinical pictures (ie, neurogenic, arterial, and venous) caused by compression of the neurovascular structures at the thoracic outlet. The classification is based on which structure is primarily involved. The relevant anatomy of TOS focuses on the scalene triangle and the costoclavicular space. Reports of compression of the neurovascular bundle at the area of the pectoralis minor space exist, but this is very uncommon and will not be discussed further. Neurogenic and arterial TOS result from compression that occurs in the scalene triangle, which is defined by the first rib, the anterior scalene muscle, and the middle scalene muscle. The subclavian artery and the branches of the brachial plexus pass through the borders of this triangle (see the image below). Thoracic outlet obstruction. Scalene triangle. Venous TOS occurs secondary to compression that occurs in the costoclavicular space. The borders of the costoclavicular space are the first rib, the costoclavicular ligament, the subclavius, and the anterior scalene muscle. As the subclavian vein passes through this space, it is susceptible to compression by these structures, as depicted in the image below. Thoracic outlet obstruction. Costoclavicular space. Other important local structures are the phrenic nerve, the lateral thoracic nerve, and the thoracic duct. The phrenic nerve passes from lateral to medial along the anterior border of the anterior scalene muscle, and the lateral thoracic nerve passes through the body of the middle scalene muscle. The thoracic duct joins cervical lymphatics and drains into the superior aspect of the jugulosubclavian vein confluence behind the left sternocleidomastoid muscle. Care must be taken to avoid injury to these structures during surgery. A search for cervical, rudimentary, or broad first ribs should be done. These structures should be resected during surgical therapy. Rudimentary ribs usually arise higher in the neck than normal first ribs and typically articulate with the second rib rather than with the sternum. Cervical ribs and rudimentary first ribs occur in less than 0.5% of the population. 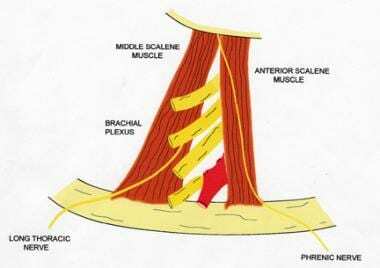 Abnormal scalene muscle anatomy also has been identified and may be a cause of some symptoms. For example, these muscles have been noted to interdigitate around the cords of the brachial plexus and, thus, have been implicated in the irritation of the cords of the brachial plexus. In a study of 98 meticulously dissected cadavers, the authors noted a number of abnormalities of the thoracic outlet fibrous bands and cervical ribs, and other abnormalities were found in most of the patients. Only 10% of the dissected cadavers were found to have normal anatomy bilaterally. Neurogenic TOS most commonly is associated with a history of neck trauma. Swollen and scarred muscles or aberrant scalene anatomy can irritate cords of the brachial plexus locally and lead to the neurologic symptoms. Arterial TOS often is associated with cervical ribs or a rudimentary first rib. [1, 2] This aberrant anatomy leads to repeated intermittent arterial compression coinciding with arm movement. This repetitive localized trauma leads to intimal lesions, focal arterial stenosis, poststenotic dilatation, aneurysmal change, and subsequent thromboembolic complications. The second portion of the subclavian artery, which has a retroscalene position, often is the site of positional compression and stricture. Venous TOS usually results from compression of the subclavian vein by the subclavius and the costoclavicular ligament. When local structures are placed in abnormal or unaccustomed positions by extremes of activity or injury, vein compression and subsequent vein thrombosis can result. Venous TOS tends to occur in the more active dominant extremity. Arterial and venous TOS usually are associated with certain predisposing anatomic abnormalities, whereas neurogenic TOS is more likely to result after traumatic injury. Neurogenic TOS is the most common presentation, occurring in approximately 95% of patients. Arterial TOS is the next most common presentation and occurs in about 2-3% of patients who are affected. Venous TOS is the least common presentation, representing only 1-2% of patients with TOS. Approximately 70% of patients with neurogenic TOS are females aged 20-50 years. Venous TOS occurs with a male-to-female ratio of 2:1. Most patients do not experience full relief of symptoms after surgery for neurogenic TOS. A good result occurs when partial relief is achieved and symptoms do not progress. Approximately 40-80% of patients who undergo surgical treatment have some relief of symptoms. Approximately 10-15% of patients who initially experience symptomatic relief have recurrence of symptoms. If only first-rib resection was performed, these patients may benefit from anterior and middle scalenectomy along with neurolysis. If only scalenectomy was performed, a second operation with first-rib resection and neurolysis may be considered. Only 40% of patients experience long-term symptomatic relief after reoperation for TOS. Patients with arterial and venous TOS usually do well if workup and treatment have been appropriate. In a study that used data from the American College of Surgeons (ACS) National Surgical Quality Improvement Program (NSQIP) to evaluate 30-day outcomes of brachial plexus surgical decompression for TOS (N = 225), first and/or cervical rib resection (± scalenectomy; n = 205) was compared with rib-sparing scalenectomy (n = 20). Rib resection was associated with longer operating times and hospital stays. Only eight patients experienced complications at 30 days of whom seven were in the rib-resection group. A systematic review of outcomes for transaxillary first-rib excision (TAFRE), supraclavicular first-rib excision with scalenectomy (SCFRE), and supraclavicular release leaving the first rib intact (SCR) in patients with neurogenic TOS found that SCR had a high probability of a success rate greater than 80%, whereas both TAFRE and SCFRE had a low probability of a success rate greater than 80% but a high probability of a success rate greater than 70%. The complication rates were 22.5% for TAFRE, 25.9% for SCFRE, and 12.6% for SCR. Kemp CD, Rushing GD, Rodic N, McCarthy E, Yang SC. Thoracic outlet syndrome caused by fibrous dysplasia of the first rib. Ann Thorac Surg. 2012 Mar. 93 (3):994-6. [Medline]. Dubuisson A, Lamotte C, Foidart-Dessalle M, Nguyen Khac M, Racaru T, Scholtes F, et al. Post-traumatic thoracic outlet syndrome. Acta Neurochir (Wien). 2012 Mar. 154 (3):517-26. [Medline]. Davidović LB, Koncar IB, Pejkić SD, Kuzmanović IB. Arterial complications of thoracic outlet syndrome. Am Surg. 2009 Mar. 75 (3):235-9. [Medline]. Machleder HI, Moll F, Verity MA. The anterior scalene muscle in thoracic outlet compression syndrome. Histochemical and morphometric studies. Arch Surg. 1986 Oct. 121 (10):1141-4. [Medline]. Maqbool T, Novak CB, Jackson T, Baltzer HL. Thirty-Day Outcomes Following Surgical Decompression of Thoracic Outlet Syndrome. Hand (N Y). 2018 Sep 5. 1558944718798834. [Medline]. Ann Freischlag J. A DECADE OF EXCELLENT OUTCOMES AFTER SURGICAL INTERVENTION: 538 PATIENTS WITH THORACIC OUTLET SYNDROME. Trans Am Clin Climatol Assoc. 2018. 129:88-94. [Medline]. [Full Text]. Yin ZG, Gong KT, Zhang JB. Outcomes of Surgical Management of Neurogenic Thoracic Outlet Syndrome: A Systematic Review and Bayesian Perspective. J Hand Surg Am. 2018 Aug 16. [Medline]. Poretti D, Lanza E, Sconfienza LM, Mauri G, Pedicini V, Balzarini L, et al. Simultaneous bilateral magnetic resonance angiography to evaluate thoracic outlet syndrome. Radiol Med. 2015 May. 120 (5):407-12. [Medline]. Kim TI, Sarac TP, Orion KC. Intravascular Ultrasound in Venous Thoracic Outlet Syndrome. Ann Vasc Surg. 2018 Sep 11. [Medline]. Orlando MS, Likes KC, Mirza S, Cao Y, Cohen A, Lum YW, et al. Preoperative Duplex Scanning is a Helpful Diagnostic Tool in Neurogenic Thoracic Outlet Syndrome. Vasc Endovascular Surg. 2016 Jan. 50 (1):29-32. [Medline]. Shalhub S, Starnes BW, Hatsukami TS, Karmy-Jones R, Tran NT. Repair of blunt thoracic outlet arterial injuries: an evolution from open to endovascular approach. J Trauma. 2011 Nov. 71 (5):E114-21. [Medline]. Caparrelli DJ, Freischlag J. A unified approach to axillosubclavian venous thrombosis in a single hospital admission. Semin Vasc Surg. 2005 Sep. 18 (3):153-7. [Medline]. Molina JE, Hunter DW, Dietz CA. Paget-Schroetter syndrome treated with thrombolytics and immediate surgery. J Vasc Surg. 2007 Feb. 45 (2):328-34. [Medline]. Schneider DB, Dimuzio PJ, Martin ND, Gordon RL, Wilson MW, Laberge JM, et al. Combination treatment of venous thoracic outlet syndrome: open surgical decompression and intraoperative angioplasty. J Vasc Surg. 2004 Oct. 40 (4):599-603. [Medline]. Sanders RJ, Pearce WH. The treatment of thoracic outlet syndrome: a comparison of different operations. J Vasc Surg. 1989 Dec. 10 (6):626-34. [Medline]. Soukiasian HJ, Shouhed D, Serna-Gallgos D, McKenna R 3rd, Bairamian VJ, McKenna RJ Jr. A video-assisted thoracoscopic approach to transaxillary first rib resection. Innovations (Phila). 2015 Jan-Feb. 10 (1):21-6. [Medline]. Kara HV, Balderson SS, Tong BC, D'Amico TA. Video assisted transaxillary first rib resection in treatment of thoracic outlet syndrome (TOS). Ann Cardiothorac Surg. 2016 Jan. 5 (1):67-9. [Medline]. [Full Text]. Kocher GJ, Zehnder A, Lutz JA, Schmidli J, Schmid RA. First Rib Resection for Thoracic Outlet Syndrome: The Robotic Approach. World J Surg. 2018 Oct. 42 (10):3250-3255. [Medline]. Thoracic outlet obstruction. Three-dimensional CT scan showing subclavian artery at the thoracic outlet. Thoracic outlet obstruction. Three-dimensional CT scan showing subclavian artery with the arm abducted. Thoracic outlet obstruction. CT scan, maximal intensity projection (MIP), showing subclavian artery in the neutral position. Thoracic outlet obstruction. CT scan, maximal intensity projection (MIP), showing subclavian artery when arm is abducted. Thoracic outlet obstruction. CT scan, maximal intensity projection (MIP), showing subclavian vein in neutral position. Thoracic outlet obstruction. CT scan, maximal intensity projection (MIP), showing subclavian vein in abducted position. Thoracic outlet obstruction. Angiogram showing subclavian artery aneurysm in abduction/external rotation (AER). Thoracic outlet obstruction. Venogram showing venous stenosis. Disclosure: Received honoraria from Harvard Clinical Research for consulting; Received honoraria from Medtronic for consulting; Received honoraria from Abbott Vascular for consulting. The authors and editors of Medscape Drugs & Diseases gratefully acknowledge the contributions of previous author Hassan Tehrani, MB, BCh, to the development and writing of this article.